Eyes Bigger Than Belly: The Watermark - Townsville's Best Restaurant? 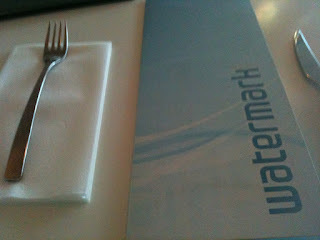 The Watermark - Townsville's Best Restaurant? It has always been a family joke that I have inherited my unattractive qualities from my Dad. While he stubbornly refuses to take ownership for my big head, ugly feet and Maori thighs – there is one thing that he openly concedes is from him. My love of solitude. I don’t mean that I am a hermit or that I hate being around people (or even that my Dad is unattractive - he's quite the cutie!). Quite the opposite in fact – but I do love the chance, every now and then, to just chill out in my own company. This has been quite a revelation to my husband who would always ask quite tentatively if he could have a boys night, go away for the weekend or even just spend the day with his mates – always to be met with me shoving him out the door with a change of clothes while mumbling about bubble baths and ice cream for dinner. But while I really do enjoy these rare moments of alone time – there is one thing that I absolutely hate to do on my own. And it’s become such an issue that when I travel – I almost always have Room Service. I hate eating dinner alone. Especially in a Restaurant. I always feel like some desperado who has no friends or someone on a blind date that got stood up. I can feel the (probably imaginary) pity eyes staring across at me – but even more that that – I hate the awkward sidestep you have to go through with the Waiter. For me – great customer service is all about the little things. It’s the little extra’s – like asking what kind of Vodka I prefer, did I have an objection to Chef cooking my pork to Medium and having Pink Murray River Salt on the table. This isn’t the first time I’ve been to The Watermark – this is actually my 5th visit and I’m happy to say that all four previous ones were consistently brilliant. I’m also ashamed to say – that on each of the four previous visits – I ordered exactly the same thing. Every time. They did this amazing dish with 12 huge Australian Banana prawns, butterflied and brushed with olive oil and garlic, then BBQ’ed. There is no smell quite like Chargrilling seafood. Served simply with Beer Battered Fries and dish of the most garlicy Aioli I have ever had – it was a dish that just couldn’t resist being demolished with abandon – fingers and all. This time though – much to my horror - that dish was missing… but I was delighted to find in its place – a menu that was bursting with so many options it took me 20 minutes and an indepth chat with the Waiter before finally being able to choose. 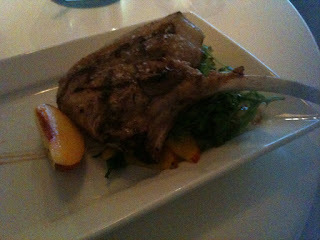 I decided on the Pork Duo – a large, but perfectly pink Pork Cutlet sitting atop a peppery rocket and sweet nectarine salad. Dressed only in the pork’s resting juices – it was a revelation. What made up the duo you ask? The 2nd piece was a generous slice of incredibly tender Pork Belly with uber-crisp skin that shattered like glass and melted seductively in my mouth. What brought the dish together was a lip tingling Chilli Jam – enough to give the back of your throat a kick but not enough to linger or make you squirm. Added to this – because the menu didn’t hint at a generous serve – was my side of vegetables. 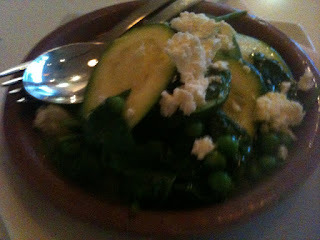 Steamed zucchini, garden peas and spinach dressed with butter and crumbled Ricotta. A simple, Peasant style dish that I will certainly be replicating at home. With my wonderful Main Course under my belt – I was debating whether or not I could actually fit in dessert. Who was I kidding? I live for dessert! 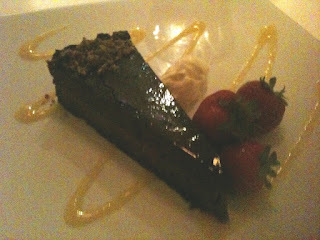 Again needing the guidance of the (now my friend) waiter – we decided on the Triple Chocolate Praline tart. And with my first bite – I was transported to heaven. Literally. The Chocolate tart was a generous but not ridiculous slice of velvety dark chocolate ganache, on a chocolate biscuit base and drizzled with yet more chocolate. All dusted with gold shards of praline. An absolute triumph - their Pastry Chef deserves a raise. I honestly could not fault any aspect of this dish. It was perfect. I would have happily paid upwards of $30 for this at an Aria-esque restaurant in Brisbane or Sydney – but here, in Townsville – I was enjoying the same quality for just $15. So tell me dear Reader, are you an Adventurous Diner... or do you stick to your favourites?The Verdict: An absolutely first class Restaurant in the heart of Townsville. Big City quality at Small Town prices – if you are in the area – this is a must dine. Haha I'm exactly the same! I really hate eating alone in a restaurant. I've only done it a couple of times when I was overseas but I'd rather order room service! I really need to stop reading your blog while I'm still starving after smashing down my incredibly uninspired tuna salad for lunch.